If you’re in the mood for scuba diving but find the Great Barrier Reef too far away, then you can head down to the Belize Barrier Reef Reserve in South America for a world-class underwater experience. The Belize Barrier Reef is the second largest reef system in the world, making it a sanctuary to a wide array of marine wildlife. In fact, in 1842, the famous Charles Darwin described it as one of the most amazing reefs in the whole world. Through several diving sites, you can experience the diversity of corals and fish that characterize the Belize Barrier Reef. One such site is the Great Blue Hole, an underwater sink hole that occupies a part of the Belize Reef system. It used to be a submerged limestone cave, until the roof collapsed and created a deep hole in the middle of the Reef. Because of its depth, it has served as host to numerous species of marine animals. The limestone content of the cave also promoted the formation of beautiful stalactites and unique coral structures. 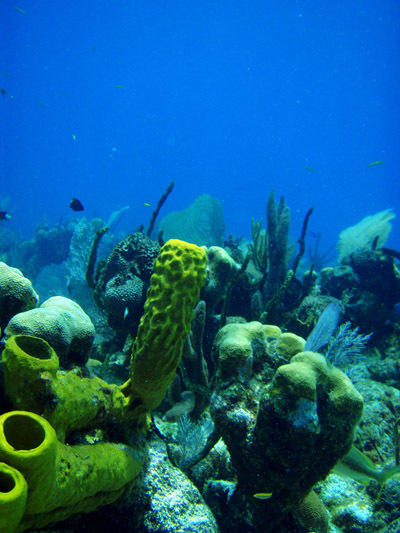 You can also go by way of Ambergris Cave to savor the majesty of the Belize Barrier Reef. In Ambergris, you can choose a diving site that suits your interests. If you’re looking to shoot underwater canyons and caverns, then Tackle Box Canyons is the dive site for you. Ambergris even has the Love Tunnels, perfect for underwater weddings. If you’re not in the mood for weddings, you can still enjoy the large coral cavern in that area, aptly called The Chapel. These are but a few of the popular diving sites in the Belize Barrier Reef system. A good many other natural reserves are still scattered around Belize and its beautiful reefs. It is good to know that many of these diving sites have been given environmental protection from the authorities. That way, future visitors such as yourself can still be wrapped up in the one-of-a-kind sea world that the Belize Barrier Reef Reserve has to offer.